Born of Chaos...Shrouded in Mystery! When Eris Beta-V's valuable commerce is threatened by unscrupulous agencies, a JumpCorp-employed team must root them out. As they do, they'll explore a magnificent ringed gas giant and its moons ont he icy fringes of interstellar space, discover ancient artefacts of enormous power among Eris' rings, moons, and asteroids, and solve the oldest mystery of Eris Beta-V...before time runs out. 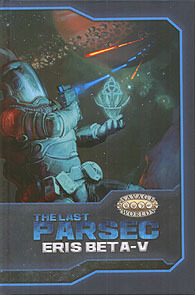 Eris Beta-V is a setting book for The Last Parsec. It contains new locations and characters for the planetary system, new starships and Setting Rules for asteroid mining and ringstorms, a Plot Point Campaign, Savage Tales, and a host of new creatures from these strange worlds.